How to can tomatoes! First, I must say that tomatoes are the easiest vegetable (or fruit) to can. If you are new at canning foods, this is a good place to start. 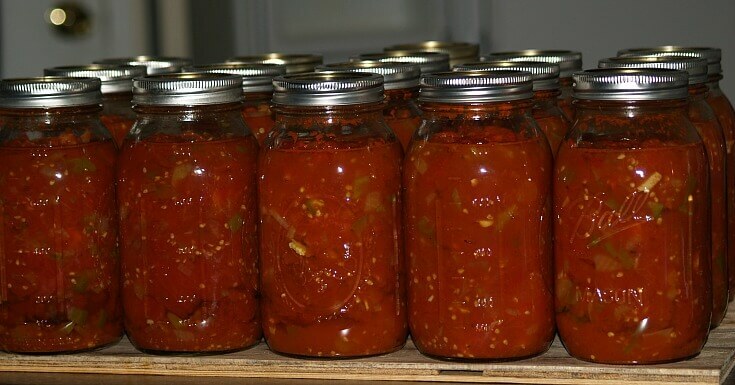 The high acidity content of most tomatoes is what makes the canning process so easy compared to other produce. I must clarify that even though tomatoes are easy to can, a process must still be followed. Some canners like to take “short cuts” and maybe skip the processing. It is now recommended that EVERYTHING BE PROCESSED either by hot water bath or pressure canned. I have had people tell me that they skip the processing for some things. This may work some of the time but it only takes one bite of one jar to get deathly sick or even death. 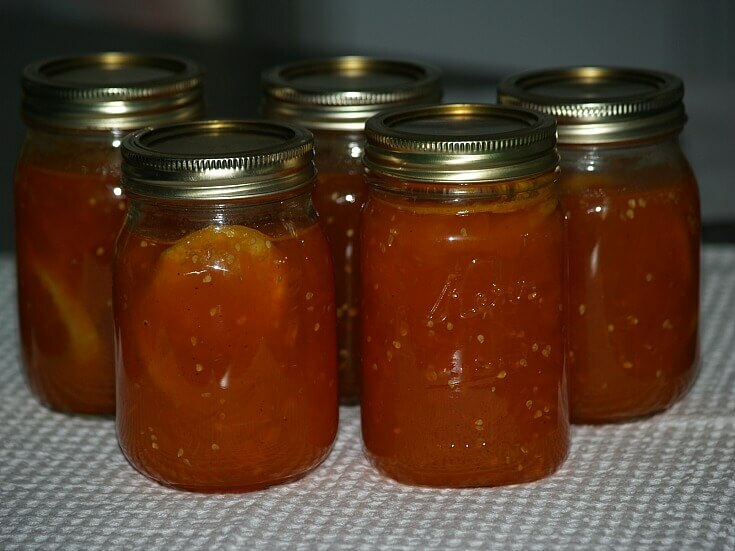 By following the recommended guidelines for canning, all the bacteria are destroyed. If you are learning how to can tomatoes, you will come across many recipes for tomatoes which also include other ingredients. Many of these ingredients are very low acid foods like meats, potatoes, carrots and others which will require pressure canning. Many recipes are also available which include vinegar. Most of these vinegar recipes and ones with only tomatoes and maybe sugar as to make jam will require only a hot water bath. I learned how to can tomatoes before anything else. The first thing I learned was to pick only good quality “fruit”. (The tomato is a fruit!) I always can at peak season; here it is July and August. This is the time when tomatoes are abundant. If you do not grow your own, they are cheaper to buy. Cut out all rotten or bad looking spots. Be sure the spots do not go all the way through; you may have to discard whole tomatoes. If you are learning how to can tomatoes, do not use any aluminum bowls or pans. I use a large 20 quart stainless steel stock pot, a 7 quart porcelain hot water bath canner, several large stainless steel bowls and stainless steel colanders. Of course, you will need canning jars, lids, rings and lots of clean kitchen towels (For messes). Set out all equipment and utensils needed. Check jars for any nicks and cracks; use new lids; fill water bath canner ½ full with hot water and put canner on to heat. Wash and rinse jars and caps; leave jars in hot water until ready to use. 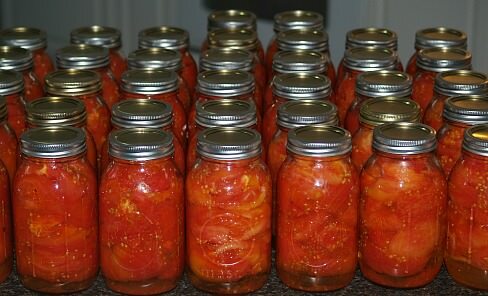 Use fresh firm, red ripe tomatoes; decayed spots and cracked one are unfit for canning. Put tomatoes in a wire basket and dip in boiling water ½ minute to loosen skins; dip into cold water. Cut out cores, remove skins and trim any green spots; leave whole or quarter. 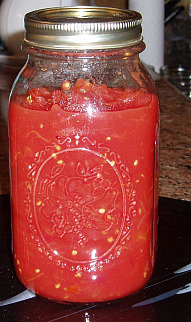 Pack tomatoes into hot jars; press tomatoes until spaces fill in with juice; leave ½ inch at top. Add 1 teaspoon of salt per quart; run table knife between tomatoes and jar to release air bubbles. Wipe top and threads of jar with a clean damp cloth; put lid on; screw band down evenly and tight. 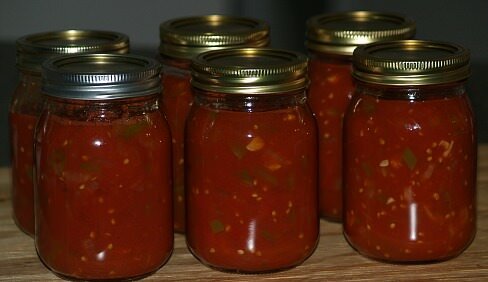 As each jar is filled stand it on the rack in the canner of hot (not boiling) water; water should cover jars one inch. Remove jars from canner; cool for 12 hours. Remove bands. Test for seal by pressing center of lid. If dome is down or stays down when pressed, the jar is sealed. You get a lot of juice from tomatoes and it is simple to can. Cook the tomatoes until soft. Put them through a sieve collecting the juice. Like V-8 juice. Combine all ingredients and bring to a boil; fill clean jars leaving 1 inch headspace and adjust lids. Process in hot water bath for 15 minutes. Core tomatoes (leaving skins on), scrape carrots and deseed peppers. Cut up all the vegetables; using a blender process until juicy about 60 seconds on high. Combine all in a large stainless steel stock pot; bring to a simmer and cook about 30 minutes. Pour into hot sterilized quart jars leaving ½ inch headspace. Process under 11 pounds of pressure for 30 minutes. Makes 12 quarts. This makes an excellent taco sauce! Dip tomatoes in hot water to remove skins; cut into small pieces. Combine all ingredients (EXCEPT CORNSTARCH) and cook on medium heat until soft about 25 minutes. Pour into hot sterilized pint canning jars; adjust lids. Process in hot water bath for 20 minutes; makes 6 pints. 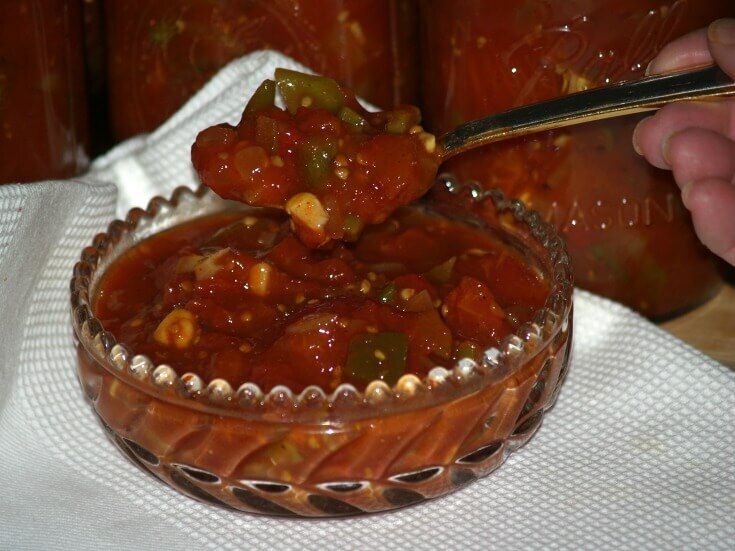 Learn how to can tomatoes making a flavorful garlic barbeque ketchup. Press through a sieve; reheat to boiling and pour into hot sterilized jars. Adjust lids on jars; process in hot water bath for 10 minutes. 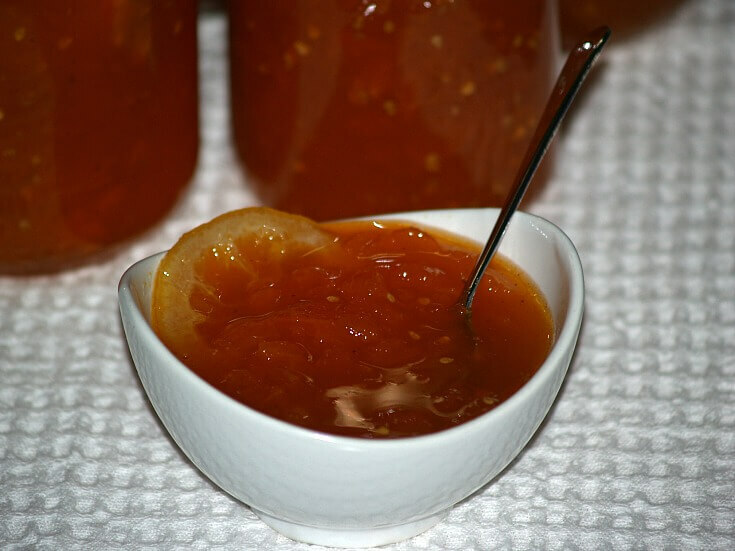 NOTE: SOME OLDER RECIPES FOR JAMS will instruct you to fill jars with hot mixture, turn upside down so the heat seals the jars. THIS DOES NOT kill bacteria. All jams and jellies need to be processed in a hot water bath for 10 to 15 minutes after filling the jars. Learn how to can tomatoes with jelly recipes. Combine juice and seasonings; bring to a boil. Add pectin and continue boiling while stirring for 3 minutes. Skim off top and pour into hot sterilized jelly jars; adjust lids. Combine tomatoes and sugar; let stand for 1 hour. Add lemon slices and nutmeg; cook until tomatoes are clear and the syrup is thickened. Pour into hot sterilized jars and adjust lids: process in hot water bath for 10 minutes. Place chopped tomatoes in small stainless steel pan; set over low heat and cover. Bring to boil, reduce heat and simmer 10 minutes stirring frequently. Remove from heat; measure out 3 cups tomatoes and liquid. In a large stainless steel pan combine the 3 cups of tomatoes with lemon juice, grated peel and sugar. Stir mixture over moderate heat until boiling; boil fast for 1 minute. Turn off heat and add pectin; stir for 5 minutes. Pack in hot sterilized jars adjusting lids; process for 10 minutes in boiling water bath. Makes 1 ½ pints. NOTE: Opalka tomatoes are great for making sauce. If you are going to make a lot of sauce these tomatoes I have found cut down on your preparation time. They have less seeds and more meat plus a delicious sweet flavor. 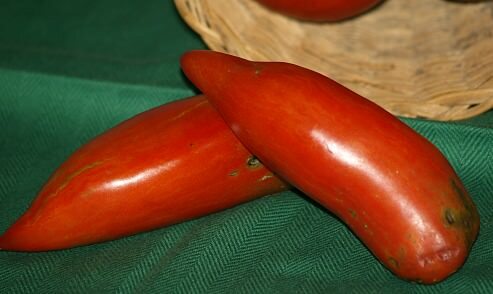 They are a large tomato about 4 to 6 inches in length. Peel, core and chop tomatoes; chop peppers and onions. Combine all ingredients; boil slowly for 4 hours or until thick. Fill hot jars leaving 1 inch headspace; process 10 minutes in boiling water bath.